Update: Have to hand it to Ask for the quick response. Within 10 minutes, the Google listing is spelled correctly. At least they didn't go do something really crazy, like put the olympic rings on their homepage. 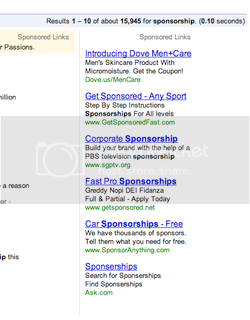 As if there wasn't something weird enough about Ask.com advertising on Google search, if the struggling search engine really wants to steal Google's share of 'sponsorship' searches, really the least they could do is spell the term right. You know, like it's shown about 50 other times on this page.